PRI’s office in Central Asia has launched a new project to develop government accountability and good governance in the law enforcement system in order to combat corruption in Kazakhstan. The project aims to improve mechanisms for increasing accountability and anti-corruption, and build interaction between the government and civil society. 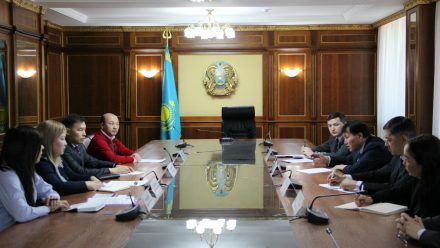 The project’s first working meeting was held this week with the Kazakhstan Agency for Civil Service Affairs and Anti-Corruption, and an agreement was reached to strengthen cooperation in studying and conducting external risk analysis, developing expert documents on identifying factors that require legislative changes, building the capacity of the agency’s hotline staff and law enforcement bodies, and involving civil society prevention of corruption in prison systems. The development of joint actions will be supported by a Memorandum of Cooperation, which will be signed in the near future. The project, which is funded by the British Embassy in Astana, takes a holistic approach to tackling corruption in law enforcement and improving the knowledge and skills of all stakeholders to tackle corruption and improve government accountability, from the level of government (Ministry of Interior, Anti-Corruption Agency) to civil society organisations and citizens. Find out more about the work of PRI’s Central Asia office.